Extremely aggressive, Ad Wolgast rose to the top of the lightweight ranks with little concern for defense and a great ability to take a punch. Tragically, he paid a terrible price for too many blows to the head. 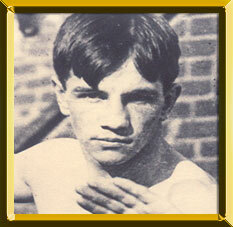 Wolgast first saw a pro fight in Petoskey, Michigan. When he didn't have enough money for a ticket, Wolgast told the promoter he was a promising young amateur and found himself being matched with Kid Moore. Wolgast won the fight in a six-round decision -- though Moore outweighed him by 27 pounds. Wolgast fought his first two years as a pro primarily in Grand Rapids and Milwaukee before moving on to fight in California. There, he knocked out two opponents, but largely fought no-decision bouts. On July 13, 1909, Wolgast, now dubbed the "Michigan Wildcat," met Hall of Famer and lightweight champion Battling Nelson in Los Angeles for a no-decision, non-title fight. The newspaper decision in the bloody brawl went to Wolgast. On February 22, 1910, Wolgast and Nelson met again in a "distance" title fight scheduled for 45 rounds. Nelson had the advantage in the early round, but by the 40th his vision was so impaired that he took his fighting stance opposite one of the ring posts, and the referee stopped the fight. Wolgast was the new world champion. Wolgast made his fifth title defense against Mexican Joe Rivers. He managed to force Rivers into accepting as referee Jack Welch, who was known to encourage the wild brawling- style fight that favored Wolgast. Rivers began well, and a discouraged Wolgast nearly did not answer the bell for the 13th, coming out only when his cornerman threatened him with a bottle. Wolgast unleashed a hard left to River's groin, while Rivers smashed him with a right-left combination to the jaw. Both fighters fell, Wolgast on top of Rivers, and Welch started a count on Rivers while helping Wolgast back to his feet. When his count reached 10, Welch raised Wolgast's arm in victory, then hurriedly fled as a mob rushed the ring. Wolgast retained his title in this notorious "double knockout" fight. His next title defense came against Willie Ritchie on November 28, 1912. Wolgast came out fighting, but in the 16th Ritchie landed a long wild right to the jaw, spinning Wolgast round and nearly sending him down. Braced with one fist on the canvas, Wolgast launched two low blows to Ritchie, and referee Jim Griffen stopped the fight, awarding the victory to Ritchie on a foul. Wolgast's all-attack fighting style resulted in numerous injuries, including broken arms, hands, and ribs, cauliflowered ears and extensive brain damage. In 1917, Wolgast fought just once and was knocked out in the second round. He fought only one more bout, in 1920, Jack Doyle, a boxing promoter in Vernon, California, was appointed as Wolgast's guardian, and allowed him to "train" for nonexistent fights. By 1927, Wolgast was institutionalized and remained so for the rest of his life.